How Can Prospective Businesses Tell If You Are Good at Manufacturing? How do you find and win new business for your manufacturing plant? Do you rely on sales people making cold calls, a strong website with inbound marketing and SEO or customer referrals? When you are prospecting new companies, how do they know that you are a better manufacturer than your competitor four states away? It can be difficult for prospective customers to trust you with their business, but one way to build credibility is through industry awards. Receiving accolades is about a lot more than simply tooting your own horn. It can be an effective method to help prospective customers tell a great manufacturer from a standard one. 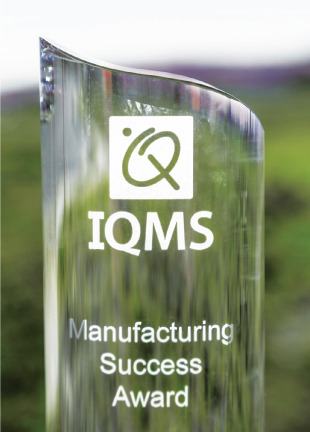 For example, numerous IQMS customers have been recognized with Manufacturing Leadership Awards by the Manufacturing Leadership Council. For the past two years, our customers have even taken home the coveted Manufacturer of the Year title. More than just the well-deserved recognition by the industry and their peers, these honors have also brought in new business! AMA Plastics conducted an Enterprise Application Analysis (EAA) to reinvigorate its use of the software, redeploy underutilized modules and maximize its use of EnterpriseIQ for impressive results. Nicolet Plastics, Inc. implemented a new order fulfillment area that included installing a conveying system, moving its assembly operations and adding new equipment such as part bins, label printers and RTStations for every press. Plastic Molding Technology, Inc.'s sustainability initiatives focused on three critical areas of improvement (development of proprietary technologies, energy savings and operational improvements) that resulted in higher levels of profitability. Protoplast Inc. developed a new manufacturing technology called Injection Transfer Blow that has virtually created a new market and attracted the attention of OEM and Tier 1 automotive suppliers, resulting in increased customers and sales. Tessy Plastics, LLC installed a tablet at each work center and implemented IQMS' RealTime Process Monitoring module and associated Android applications to collect and analyze detailed process parameters for better quality control. While awards for our customers typically equal an increase in new business, for IQMS, the accolades they receive mean something much more. To see our manufacturers on stage, basking in the admiration, we take great joy in knowing we were part of that victory. One of my all-time favorite moments was when immediately after one of our customers won an award, a representative from a Fortune 500 company walked up to him and asked why their two companies weren’t doing business together. IQMS is not just selling manufacturing ERP and MES software, we are selling customer successes. Award season is nearly upon us. If your company is interested in IQMS nominating you for an award, email marketing@iqms.com. We look forward to telling your story!